In the framework of the event "Per una scuola innovativa e inclusiva: le opportunità in Erasmus+, nuova programmazione", organized on January, 21st at Istituto Comprensivo “Maria Montessori” in Terracina (Italy), Dr Michela Tramonti, as vice-President of EU-Track Association, presented the new guidelines for Erasmus+ 2019 and Ing. Alden M. Dochshanov, as scientific coordinator, presented the Coding4Girls project aims and activities. The event has been started up by the Major of the City, Dott. Nicola Procaccini and by the school headmaster, Prof.ssa Barbara Marini. 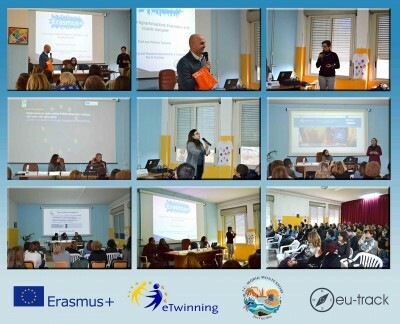 While Prof.ssa Maria Cristina Bevilacqua was involved as eTwinning Ambassador and Prof. Guido Gerosa, as teacher in the I.C. Montessori, presented the G.A. STEM project aims and objectives. The successful event has reached a high number of teachers and students of every order and grade.